There is no homework to print out this week! 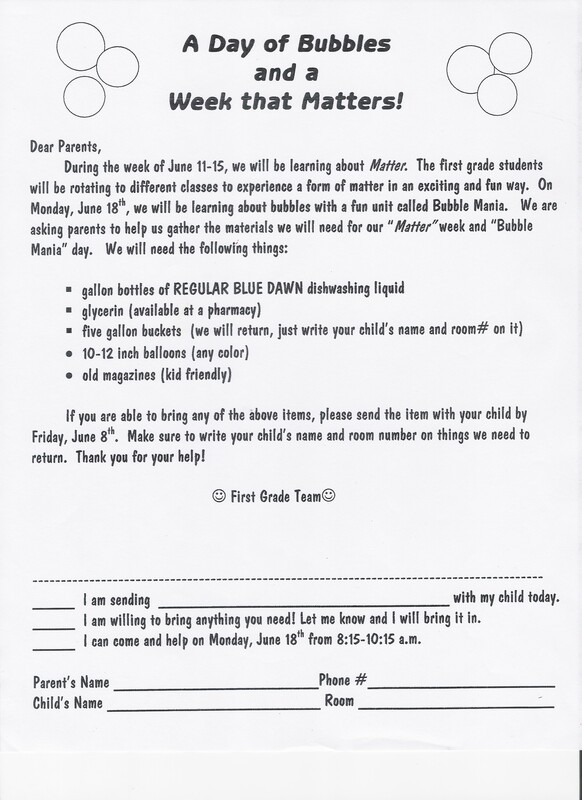 Please look for the Bubblemania letter in your child's folder. Their last assignment is to create a bubble wand to bring to bubblemania day next Monday. Have fun! Please check the windows of your child's classroom to sign-up to help or donate items for the last week of school. WE NEED LOTS OF BLUE DAWN TO MAKE BUBBLES! We also need glycerin (available from CVS or other pharmacy type stores) to make the bubbles hold their shape. Kids should wear tennis shoes because we will be having some soapy fun! Kids can dress in their luau/Hawaiian beachy attire. Please have girls wear shorts under sundresses as we will be doing limbo and some other fun outside games. Students should also bring a beach towel to sit on. This is also the day where kids will take everything home! Please make sure they have a backpack or large bag that day. Thanks! Please note that kids get out at 1:00 on this day! As we head into these last few weeks of school it's time to check in and take a moment to look at the work your child is bringing home. Although we do not test like those in grades 2-5, we do have indicators that we look at to show if a student is working at grade level. To help us out, please take time to look through your child's folder each day. During homework, make sure they are using capitals and ending marks and that their printing is readable. When reading, students should be working on their fluency and should no longer be stuck on common sight words and word families. We ask you to do this because keeping their skills up during the summer will be up to you! The computer programs (RAZ-kids, Study Island, V-math) will be available during the summer to help keep their skills sharp! * We are going to be decorating cereal boxes for an Open House project. Please send in a cereal box (or more if you can). Costco sized boxes are too big--just a regular sized box will do. Thanks!! *The office would like us to remind everyone that attendance is taken right after the second bell rings at 8:15. Anyone who comes in the room after the second bell will be marked tardy. Thank you for helping your students get to school on time! *All students MUST line up on the blacktop in the mornings. There should NOT be anyone in the hallways before school. We have seen groups of students and parents waiting by the classrooms in the morning and we need everyone in line with their class. Please help keep the hallways clear. Thank you! *Unless you are signed up to help that day, no one is to walk into the classroom for any reason. Lunches brought late should be dropped off in the office, they will let your child know it is there. Our school day begins the minute we pick up our class from the blacktop. *We love speaking with you, but please do not wait by the door in the mornings. We are trying to get our students in the door and be attentive to their needs, so if you need to speak to your child's teacher please wait until after school if possible. Thank you for helping us get our day off to a smooth start! We really appreciate your help with these matters. Once you are on the website click "directory", then find "teaching extras" and then look for and click on "book report forms." There are many great book report templates you can print out. It's always fun to find and try new ways for you child to share what they learn! *Attach all spelling homework for an "o" grade, but it must be neat and complete to earn an "o".